Very nice plataform game !!!! 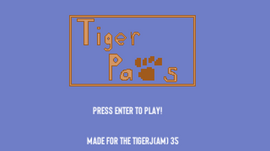 TigerQuest is a simple adventure game where you have just one quest, help TigerJ to find a very important item for a Tiger. Enjoy :)! PS: All SFX was made from TigerJ stream, and the music it's a CC0 from web. I hope he doesn't mind x). A browser to safety made in HTML5.